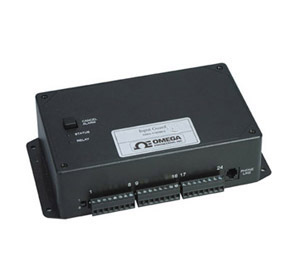 Model OMA-VM500A-6 monitors up to eight switch closures (dry contacts) which allows you to connect a wide variety of sensors such as magnetic door or window switches, thermostats, fluid level switches and motion sensors. The OMA-VM500A-6-LV monitors up to 8 switch closures (dry contacts) or 24 Vac/Vdc inputs. This dialer allows the user to program a “normal” state and a time delay for each input. A 5-second message can be recorded to define each input. An additional local identification message can be recorded to identify the dialer. When an input is different from the programmed “normal” state for longer than the time delay, the unit will dial up to 4 phone or pager numbers. The integrated voice tells the user which zone is in alarm and the current status. Call the unit at any time to hear a status report, including power status. The user can complete all programming over the phone by following simple voice instructions. When the dialer goes into an emergency state, it will energize the alarm relay, activate the alarm buzzer, and begin making emergency calls. When the unit dials a voice number, it will first play the local identification message and the current status of any inputs that caused the emergency state. The unit ceases to be in the emergency state once contact is made with the unit. When the dialer is in alarm condition, it will dial all programmed phone numbers until contact is made. If contact has not been made after dialing all phone numbers, the dialer will wait 20 minutes and then begin calling again. This sequence is repeated until contact is made. When the dialer calls a voice phone number, it will play the local identification message and the current state of any input that caused an alarm and power status. The dialer will then prompt the user to enter the PIN. When the correct PIN is entered, contact has been made and the dialer will stop calling. If the dialer calls an answering machine or voice mail, the dialer will leave the warning message and will continue to call. When the dialer calls a pager number, it will transmit the programmed local ID number, any inputs that have caused an alarm, and the line voltage (power) status.Contact is made when the user enters the 4-digit PIN number, or—if the user is on site—presses the cancel button located on the front of the dialer. If the input(s) return to the programmed “normal” states, the unit will also cease to be in the emergency state. Models with this option contain an alarm relay that may be controlled from a remote location through a standard touch tone telephone. 참고: Each unit is supplied with complete user’s manual.